Reflections is a local, regional, state and national art exhibtion and contest for ALL students. This year's theme is "HEROES AROUND ME". Unleash your inner artist and create a painting, sculputre, mixed media, print, photograph, dance, film, music composition or literary composition expressing what "HEROES AROUND ME" means to YOU. Entries are due Wednesday, October 10, 2018. For more information: Erin Mackay, echasenyc@me.com. Learn more about the program at http://www.jcpta.org/programs/reflections/. 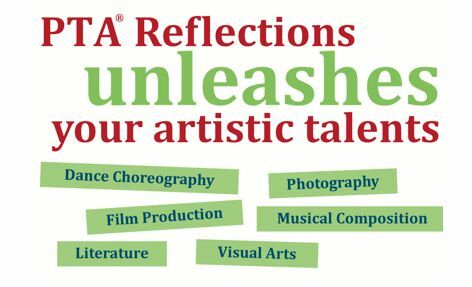 Visit the National PTA Reflections page for more information!